Skeevers are small, aggressive, rat-like animals that attack on sight. They may be encountered in dark areas, such as caves or dungeons, as well as in the wilderness of Skyrim. They are generally considered to be the weakest enemy in the game, although they often carry the disease Ataxia, which lowers your Lockpicking and Pickpocket skills. 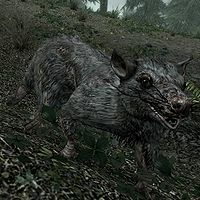 Skeever corpses may be looted for skeever tails to be used as ingredients in alchemy. Dead skeevers found roasting over fires yield charred skeever hide, but it is not possible to roast a skeever yourself. The Venomfang Skeever is encountered during the Dampened Spirits quest in Honningbrew Basement. It is said by the owner of The Winking Skeever in Solitude that skeevers weren't always as large as they are now. A greater power named Polymorph Skeever exists in game data which would have allowed you to transform into a skeever. However, the power is bugged and not found in the game. This page was last modified on 9 September 2018, at 14:02.